The initiative supports Arab women scientists and researchers in the region to pursue scientific research by awarding valuable fellowships. 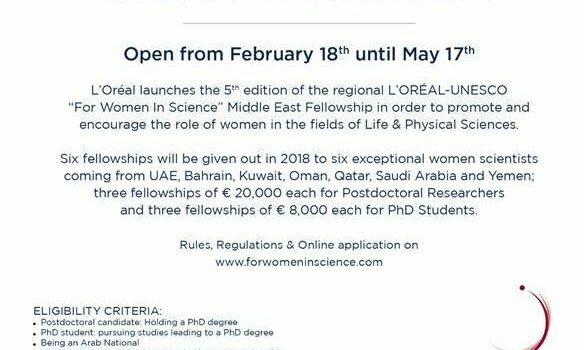 This year fellowships of EUR 84,000 will be given to 6 Arab female scientists either holding a PhD degree or are currently PhD students in the fields of Life Sciences or Physical Sciences and working in the UAE, Bahrain, Kuwait, Oman, Qatar, the Kingdom of Saudi Arabia and Yemen. To apply and for more details, researchers should visit www.fwis.fr and submit the required documents and details between the 18th of February and the 17th of May 2018. All applications will be evaluated by a Pan Arab panel of eminent scientists, chaired by Prof. Mouïn Hamzé President of the Jury & Secretary General of the National Council for Scientific Research – Lebanon (CNRS-L).